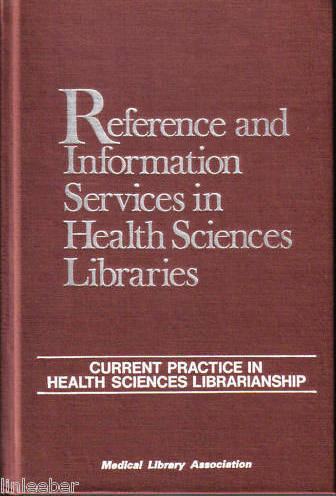 Reference and Information Services in Health Sciences Libraries by Sandra Wood (Author) Hardcover: 394 pages Publisher: The Scarecrow Press, Inc.; 1 edition (June 1, 1994) Language: English ISBN-10: 0810827654 ISBN-13: 978-0810827653 Product Dimensions: 9.1 x 6 x 1.1 inches Shipping Weight: 1.5 pounds This was purchased for a class but never used. Product Description This is volume 1 of Current Practice in Health Sciences Librarianship, the new series that replaces MLA's classic "Handbook of Medical Library Practice". This volume documents current practice, state of the art innovations, and trends in health sciences reference and information services, with an emphasis on new technologies. Chapters included are "General Reference Services," "Databases and Database Searching," "Microcomputers and Reference Service," "Management of Reference Service," "Specialized Types of Management and Reference Services," and "Information Technologies-Now and the Future." Contents emphasize developments in reference services over the past decade, along with future directions based on changes in information technology. The volume is aimed at practicing health sciences librarians and information science students and is relevant to other librarians as well. About the Author Sandra Wood (M.L.S., Indians; M.B.A., Maryland), Librarian, Reference and Database Services, George T. Harrell Library, Milton S. Hershey Medical Center, Pennsylvania State University, Hershey, Pennsylvania, has more than twenty years of experience in all aspects of health sciences reference services. She is founding editor of Medical Reference Services Quarterly, is the author of numerous books and journal articles, and is an active member of the MLA.